You can use SMPlayer. During the installation, select the "mpv" backend, NOT "mplayer". In the smplayer settings, in the "network" section, set the "support for video sites" setting to "mpv + youtube-dl". You can now drag and drop videos and video links from youtube to the smplayer window. streaming which doesn't have the compression artifacts that their 1080p encoding do. It's been a while since I used smplayer in Windows (I use Linux), so it might not work the same anymore. I'll give it a try later today to see if something changed in regard to g-sync. You can tell if g-sync is working by swithing to fullscreen and moving your mouse. If the mouse cursor is jerky and low FPS, then g-sync is working. When viewing a 30FPS video for example, the mouse cursor would move with 30FPS too because of g-sync. If it instead moves as fluid as on the desktop (144Hz or whatever your monitor is), then g-sync is not working. G-Sync now works for me. The important options are "--gpu-api=opengl --gpu-context=win". By default, opengl is translated to direct3d using the ANGLE libraries, which is made for people who use GPUs that don't have good opengl drivers (like integrated graphics.) 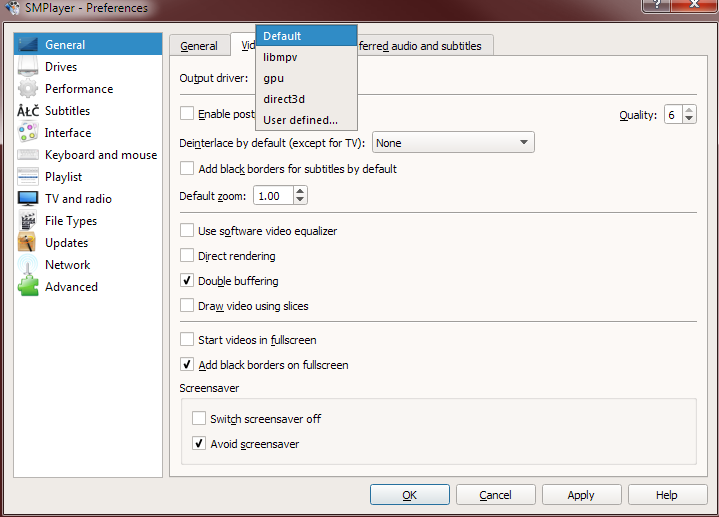 G-Sync doesn't appear to work when doing this, so when telling mpv to use the native opengl driver with these two options, g-sync works. Ok Thank you very much, it is working fine. One last option I forgot is "--profile=gpu-hq". This enables maximum quality video processing (scaling, chroma conversions, shaders, etc.) I already use that on Linux but I forgot to copy that option over to Windows. There's many other options mpv has. For example you can do FPS interpolation to round-up 25FPS videos to 30FPS for example if you decide to not use g-sync. For that to happen, you'd add the "--interpolation" option. This will convert videos to an FPS that can be displayed without judder. Although g-sync is probably better here, because FPS interpolation adds motion blur. If it prints a message that says it updated to a new version, you then need to wait when it says "Waiting for file handle to be closed". 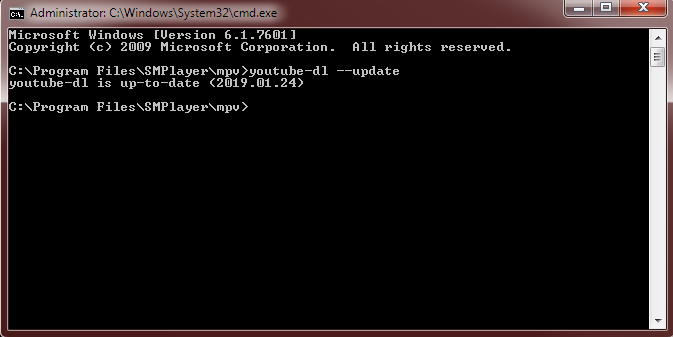 After a few seconds, it will say "Updated youtube-dl to version ..." at which point you can close the command prompt window. Last edited by wenarlin on 24 Jan 2019, 19:23, edited 1 time in total. It's up to date because you just installed smplayer, which downloaded the most recent youtube-dl version. I'm just saying that if one day youtube videos stop working, then this is usually because you need to update it. Using VRR to smooth video playback (23.97fps, 24fps, 25fps, 30fps, 59.94fps, 60fps) is clever. SMPlayer is one of the few VRR-friendly video players that does a good job of that. Now YouTube needs to add HFR 120fps support!